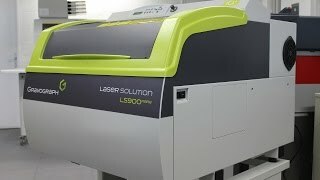 The LS100Ex Fiber and LS900 Fiber are laser engraving solutions for metal and large surfaces. 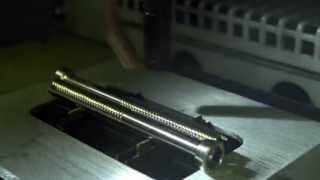 They are perfect for engraving directly onto a range of metal parts and plates. LS100 EX Fibre in action! The LS100Ex Fiber and LS900 Fiber machines are perfect solutions for engraving on metal parts without the need for application of a surface additive. Precision and contrast are thus guaranteed on all your work pieces. These solutions also produce excellent results on plastics. Both can be integrated easily into an industrial workshop or commercial environment. They meet all your item personalisation, engraving and identification needs. Laser sources ranging from 20 to 50W for precise engraving jobs, deep marking work and mass produced items. The machine is designed to maximise convenience: front opening makes for convenient access and means that workpieces can be loaded from the front and adjusted effortlessly. Via the ergonomic LCD control panel, engraving jobs can be selected from the list loaded directly onto the machine. The autofocus guarantees engraving precision. Optional accessories are available which further extend the capacities of the LS100 Fiber and the LS900 Fiber. A range of low power exhaust systems maintain a clean working environment. The fiber laser range is totally safe and operates in a standard environment (locked glass door). The machines are CDHR Class I certified. LS100Ex Fibre 24" x 12"
LS900 Fibre 24" x 24"
Gravostyle™ Laser Graphic and its professional graphics software driver are included. Operating in the Windows® environment.